What Is Causing The Depression Epidemic? Work. School. Family. Friends. Hobbies. Travel. The list goes on and on and on. There’s no doubting that today’s world is busier and caught up in the hustle and bustle more than ever before. There are so many various paths to go down – and that’s all without even acknowledging the deeply-rooted uncertainty about our lives that resides within the center of us all. Throw social media and hyper-connected populace into the mix, and a recipe for disaster is concocted. But is there any truth in the assumption that our gadgets and social media platforms are contributing to the outburst of generational depression? Young adults today are more predisposed to suffering under the tyrannical influences of anxiety and depression than ever before. Although the recent surge over the last decade and a half has led some to posit that the influx remains merely tied a shift in perception – that is, the increase in reported afflictions as compared to the olden days, where people would just “tough it out”. Unfortunately, the data shows otherwise. The increase in anxiety and depression among individuals of sorts of age groups – and not just young adults – has been on a dramatic rise, and the factors are multitudinous. With pressure to have a successful career, well-built and healthy relationships, all alongside cultivating a healthy public image in person and online, it’s no wonder that the pressure is becoming too much for us. However, the problem may have more to do with the manner in which teens focus their attention on social media sites and the interactions they have there, rather than the implied malice of the tools themselves. Rather, the problem seems to be – once again – us. The anonymity and instant-establishment of lines of communication between two parties has cast forth the plague of cyber-bullying upon us, and there’s still no telling if the end is near. Out of a sample of nearly 6000, the Cyberbullying Research Center has found that nearly 33% of teens between 12-17 have experienced some form of cyber-bullying or digital harassment in their lives. 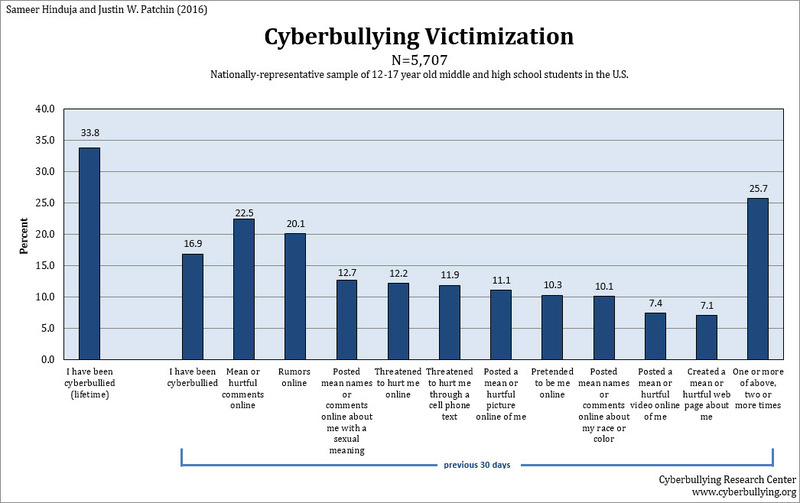 Perhaps the most alarming statistic is the fact that 25.7 percent of all teens who have experiences cyber-bullying have done so on repeated occasions. Bullying in school halls and classrooms has been a problem for decades, but when it is compounded with the effects of a virtual space that refuses to go away, it becomes something that festers horribly. One’s teen years are fraught with navigating a turbulent social microcosm while simultaneously attempting to figure out who one is, but it seems that for whatever reason, the proportion of abusers is skewed toward teenage males. 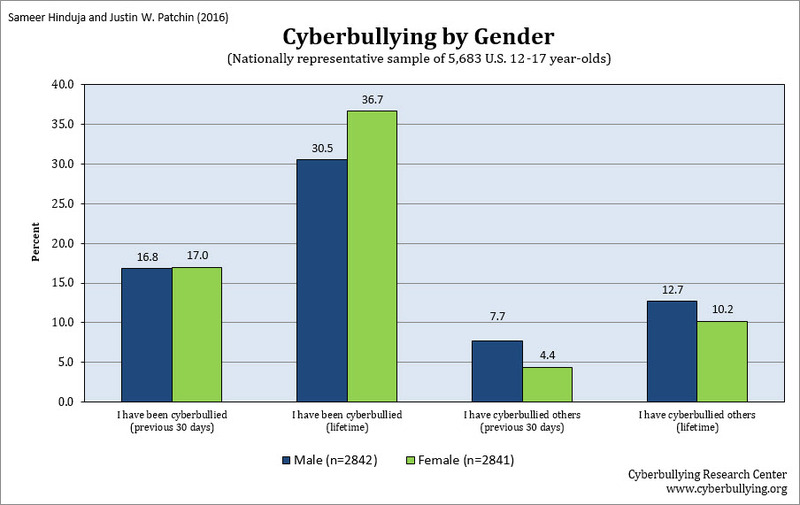 Deeper research yielded that 12.7% of the sample’s males had cyberbullied others at some point in their lives, with females trailing behind at 10.2%. While this data specifically zeros-in on a teenage sample size, there is no question that negative interactions in cyberspace continue to provide a source of negative interactions in workplaces around the world – albeit at much lower frequencies. Anonymity has proven that it falsely bolsters the courage of those that are seeking to inflict harm upon others, and we can all agree that it is far too easy to merely make a new social media account under a different alias. A staggering 18% of adults in the United States are afflicted by a mental health condition – among which the most common are anxiety and depression. That 18% translates into over 43 million Americans – 9.6% of which idealize suicide as their best course of action regularly. Perhaps the largest factor in the sudden and massive increase in reported mental health issues is the ubiquitous nature in which social media networks have become a core part of our daily interactions with others. No longer is it necessary to present your best self when out and about in public, now one must craft the best image of themselves to put forward on social media sites – and the cycle never ends. Always only a button press away, the rest of the online population is naught more than a swipe or tap away – as is their subjectively catered highlight reel of their lives. When you’re less than five seconds away from comparing your unique path through life with another’s perceived success, you’re already setting yourself up for trouble. Anxiety will always occur when one is ruminating on future events that will likely come to pass. Depression acts almost exclusively on the past, casting our thoughts to untruthful reconstructions of ourselves that will see the beauty of who we truly are ruined in vicious acts of self-sabotage. When these symptoms are exacerbated by the looming pressure of remaining connected in an always-online world, it’s no wonder that the symptoms are skyrocketing. We are likely never turning back from the hyper-connected reality that has been ushered in by the Internet Age, but we can absolutely learn to leverage the tool as a way to ensure that we each shine in our own unique way, and cast the current behaviors of comparison, envy, and self-deprecation far away into the past.